I can't even begin to imagine what it must be like to wake up with perfect vision. To start the day without having to reach for glasses or pop in some eye contacts. It's something I used to think about all the time, believing the stereotype that glasses were geeky and unattractive, refusing to wear them outside of my house or college. But now I've come to terms with the fact that laser eye surgery is a major nope for me (I've seen Final Destination, so enough said on that!) and I've actually learned to fall in love with glasses for the first time. Since discovering Glassesshop.com, I've realised how fun it is to wear glasses and accessorise your facial furniture to tie in with all outfits and occasions. I've actually *collaborated with the company a couple of times now, but the excitement of selecting a new pair of frames never dulls. If you've followed me from a while you'll have seen that I've previously chosen more contemporary glasses online, but this time I wanted to go for something more classic, and instead opted for these gorgeous frames in a brown tortoiseshell design. 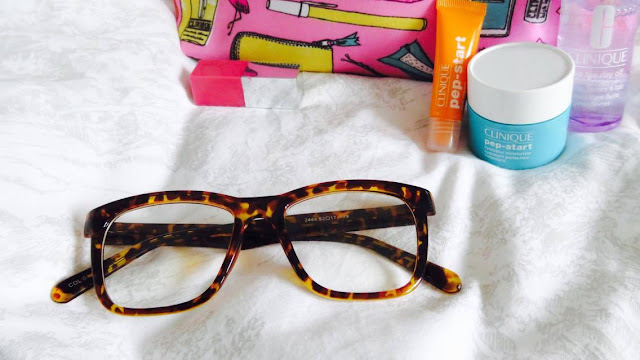 An all round winner for days when I'm not feeling particularly bold, or want to go for a laid back, off-duty look, these inexpensive frames are perfect. 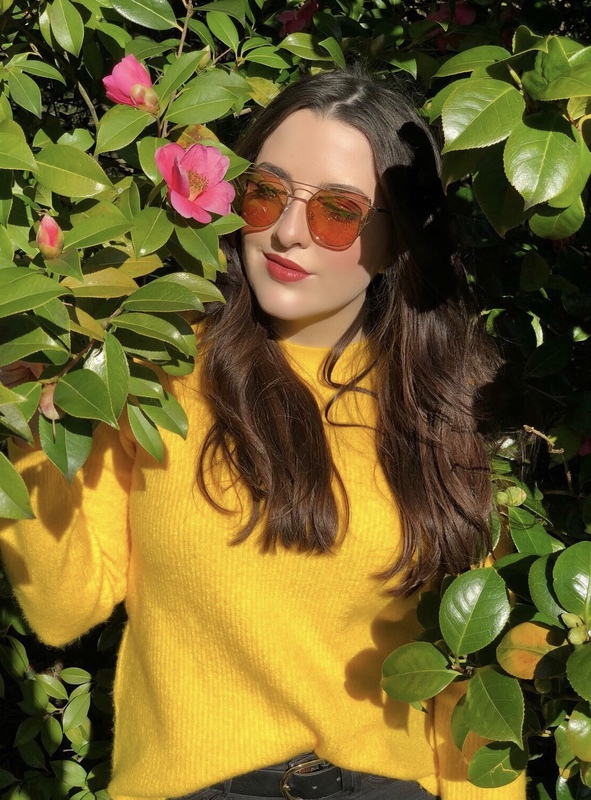 There's a whole host of affordable frames and prescription sunglasses on their website to choose from, so even if you're lucky enough to have perfect vision you can purchase frames without prescription lenses to wear them for fashion purposes! 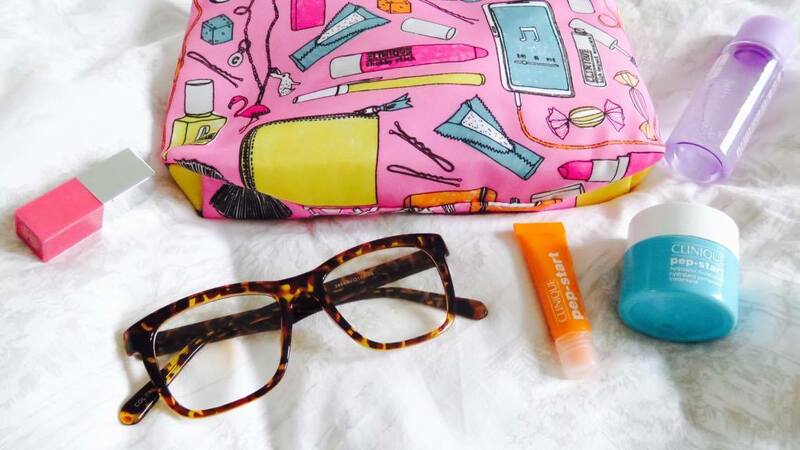 As always, the eyeglasses I chose arrived incredibly quickly, perfectly packaged, in a handy glasses case to ensure they didn't arrive in a million pieces, plus they keep them snugly stored when they're not in use in the bottom of my handbag. If you wear glasses too, I'd love to hear where you get yours from or what kind of style you personally love to wear in the comments below - for me it's always Wayfarer-esque frames! After yet another brief hiatus from the bloggersphere, I'm back feeling inspired, refreshed and more motivated to create new content on my little blog (apologies in advance for the iPhone quality imagery though..). Maybe it's the fact that today was the first day of Spring, but it's undeniably easier to create blogs when it's actually light still by the time you get home from work - hallelujah! And Spring is exactly what the topic of my comeback blog is about. Well, not exactly Spring itself, but the effects that the change in weather have had on my skin, and how I've been combating it. So I don't know about you, but I find that the moment a new season begins to turn, my skin has a complete meltdown, and it's usually just as I've cracked my skincare regime - annoying! I have pretty sensitive, dry skin, and over the last few weeks have found that my Clarins products just weren't cutting it (no hate at all to Clarins, they took care of my face through the harsh winter months, but the change in weather calls for a new arsenal of beauty products). After experimenting with the vast array of lotions and potions I've been hoarding in my cupboards, to no avail, I decided it was time to head to Boots in search of something that, would not only smooth my dry skin, but brighten it too. 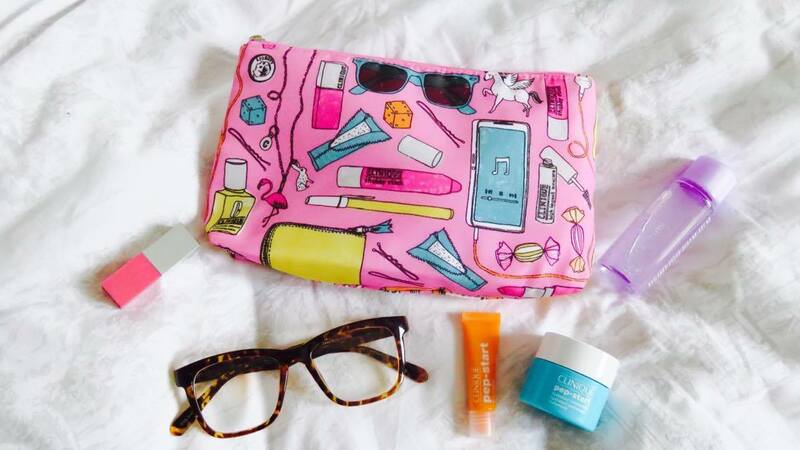 After all, don't we all lust after that dewy glow the moment the sun begins to shine again! 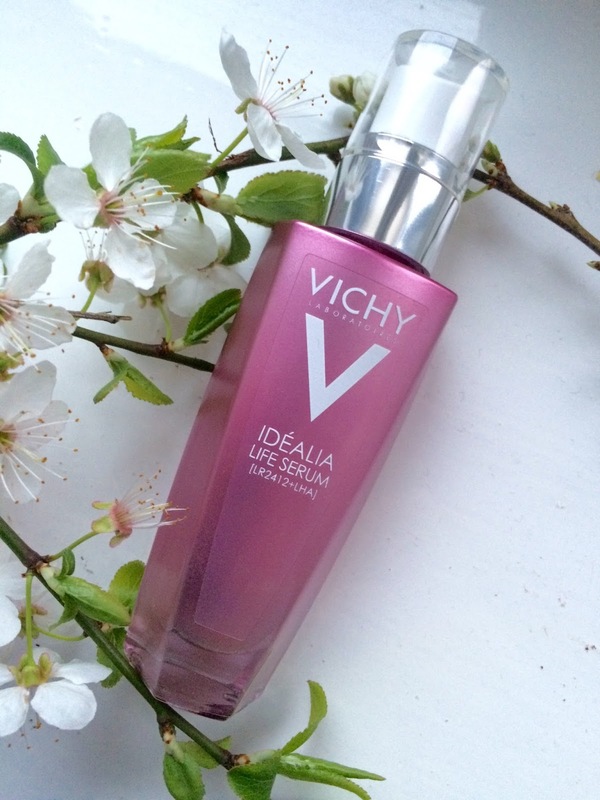 It was there in Boots I stumbled upon Vichy's Idealia Life Serum. There's no denying I was captivated by the iridescent, unicorn-esque packaging, but I was also intrigued by the products claims. It also claims that within 4 weeks your skin will appear visibly refined, rested, healthier and younger. And though I've only been using the product for a little over a week, I've already begun to notice the effects of the product. 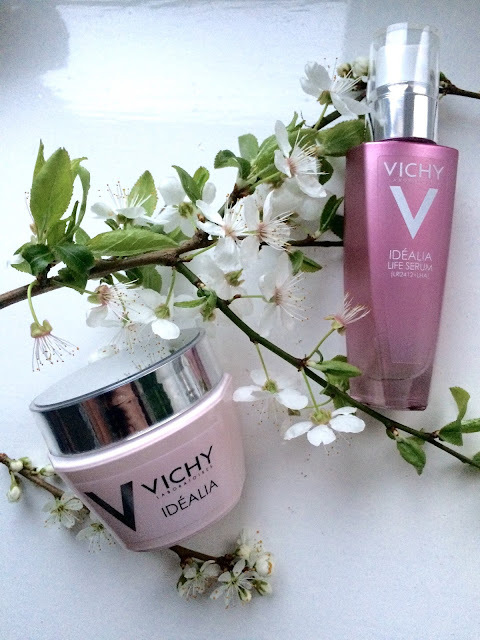 Teamed with Vichy's Idealia Creme de Lumiere Lissant, my once parched skin is not only quenched, but visibly more even. I can't even begin to say how impressed I am with how much easier it's made the application of my foundation too. In fact, it's made such a difference I'm considering switching from Estée Lauder's Double Wear foundation, to Double Wear Light - which for a die hard DW fan, is a huge deal! Obviously I can't go into great detail about either of these products because I really haven't used them enough to give an official verdict, but I am seriously impressed with the results so far, and can't wait to see what my skin is like in a few weeks from now. 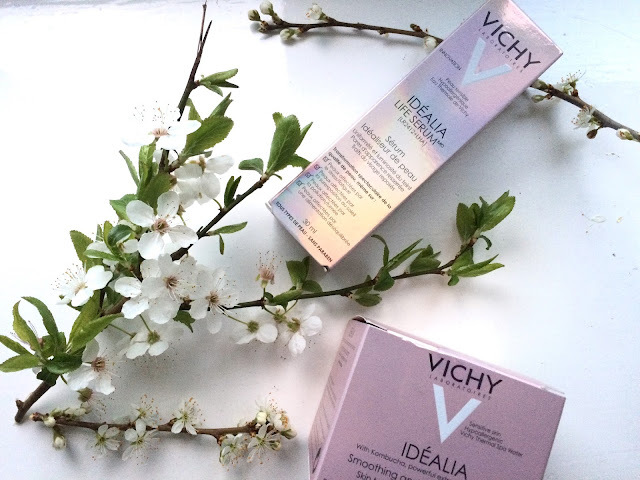 If you've used any of Vichy's products before and can recommend anything in particular, let me know below - I'm always up for discovering new skincare products!